For the use of this term in an earlier or wider context, see Endowment (Latter Day Saints). 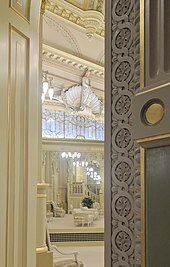 The celestial room represents the highest level of heaven in LDS theology, and is reached after passing the testing portion of the endowment ceremony. In Mormonism, the endowment is an ordinance (ceremony) designed to prepare participants to become kings, queens, priests, and priestesses in the afterlife. As part of the ceremony, participants take part in a scripted reenactment of the Biblical creation and fall of Adam and Eve. The ceremony includes a symbolic washing and anointing, and receipt of a "new name" which they are not to reveal to others except at a certain part in the ceremony, and the receipt of the temple garment, which Mormons then are expected to wear under their clothing day and night throughout their life. Participants are taught symbolic gestures and passwords considered necessary to pass by angels guarding the way to heaven, and are instructed not to reveal them to others. As practiced today in The Church of Jesus Christ of Latter-day Saints (LDS Church), the endowment also consists of a series of covenants (promises to God) that participants make, such as a covenant of consecration to the LDS Church. All LDS Church members who choose to serve as missionaries or participate in a celestial marriage in a temple must first complete the endowment ceremony. The endowment as practiced today was instituted by founder Joseph Smith in the 1840s with further contributions by Brigham Young and his successors. The ceremony is performed in Latter Day Saint temples, which are dedicated specifically for the endowment and certain other ordinances sacred to Mormons, and are open only to Mormons who meet certain requirements. There was a brief period during the construction of the Salt Lake Temple where a small building referred to as the Endowment House was used to administer the endowment ordinance. The endowment is currently practiced by the LDS Church, several denominations of Mormon fundamentalism, and a few other Mormon denominations. The LDS Church has simplified its ceremony from its 19th century form and has removed some of the more controversial elements. A distinct endowment ceremony was also performed in the 1830s in the Kirtland Temple, the first temple of the broader Latter Day Saint movement, which includes other smaller churches such as the Community of Christ. The term "endowment" thus has various meanings historically, and within the other branches of the Latter-Day Saint movement. The prevalence of LDS Church members who participate in the endowment ceremony is difficult to determine. However, estimates show that fewer than half of converts to the LDS Church ultimately undergo the endowment ceremony, and young people preparing for missions account for about one-third of "live" endowments (as contrasted with proxy endowments for the deceased). Latter-day Saints cite various Old Testament references to temple ordinances such as those found in Exodus 29:4-9 and Exodus 28:2-43 and Leviticus 8:6-13. The words "HOLINESS TO THE LORD" can be found on LDS temples as referenced in Exodus 28:36. The Latter-day Saint temple is referred to as a "house of learning" since it is a "kind of educational environment teaching by action and educating through ritual." The endowment ordinance, as presented in Latter-day Saint temples, has been referred to as a "ritual drama" that commemorates episodes of sacred history due to its “theatrical setting.” When viewed as a restoration of ancient rites, the ritual drama and aesthetic environment in which the endowment is presented are both rich in Judeo-Christian symbolism. Comparative studies of the art, architecture, and rituals found in Mormonism, such as the endowment, reveal parallels to early Catholic and Jewish traditions. Woman's endowment clothing circa the 1870s, from an illustration in Mark Twain's Roughing It. The meaning and scope of the term endowment evolved during the early Latter Day Saint movement, of which Mormonism is a part. The term derives from the Authorized King James Version, referring to the spiritual gifts given the disciples of Jesus on the day of Pentecost, in which they were "endowed with power from on high," Christians generally understand this endowment to refer to the gift of the Holy Spirit, which the Latter Day Saints believe is given at the Confirmation ceremony. In 1831, however, Smith began teaching that the elders of the church needed to be further "endowed with power from on high" in order to be effective proselytizers. He therefore gathered the elders together at a General Conference in June 1831 and "endowed" them with this power by ordaining them to the High Priesthood. By the mid-1830s, Smith was teaching that a further endowment was necessary, this time requiring the completion of the Kirtland Temple as a house of God where God could pour out his Holy Spirit. Upon the completion of the Kirtland Temple after three years of construction (1833–1836), the elders of the church gathered for this second promised endowment in early 1836. The Kirtland endowment included a ritual ceremony involving preparatory washings and anointings with oil, followed by a gathering in the temple in which many reported spiritual gifts such as speaking in tongues and visions. The Nauvoo endowment consists of two phases: (1) an initiation, and (2) an instructional and testing phase. The initiation consists of a washing and anointing, culminating in the clothing of the patron in a "Garment of the Holy Priesthood", which is thereafter worn as an undergarment. The instructional and testing phase of the endowment consists of a scripted reenactment of Adam and Eve's experience in the Garden of Eden (performed by live actors—called officiators; in the mid-20th century certain portions were adapted to a film presentation). The instruction is punctuated with oaths, symbolic gestures, and a prayer around an altar, and at the end of instruction, the initiate's knowledge of symbolic gestures and key-words is tested at a "veil." On May 3, 1842, Joseph Smith prepared the second floor of his Red Brick Store, in Nauvoo, Illinois, to represent "the interior of a temple as circumstances would permit". The next day, May 4, he introduced the Nauvoo endowment ceremony to nine associates: Associate President and Patriarch to the Church Hyrum (Joseph Smith's brother); first counselor in the First Presidency, William Law; three of the Twelve Apostles, Brigham Young, Heber C. Kimball and Willard Richards; Nauvoo stake president, William Marks; two bishops, Newel K. Whitney and George Miller; and a close friend, Judge James Adams of Springfield, Illinois. the communications I made to this council were of things spiritual, and to be received only by the spiritual minded: and there was nothing made known to these men but what will be made known to all the Saints of the last days, so soon as they are prepared to receive, and a proper place is prepared to communicate them, even to the weakest of Saints: therefore let the Saints be diligent in building the Temple. Throughout 1843 and 1844 Smith continued to initiate other men, as well as women, into the endowment ceremony. By the time of his death on June 27, 1844, more than 50 persons had been admitted into the Anointed Quorum, the name by which this group called themselves. There are many similarities between Smith's endowment ceremony and certain rituals of Freemasonry, particularly the Royal Arch degree. These specific similarities included instruction in various signs, tokens, and passwords, and the imposition of various forms of the penalties for revealing them. The original wording of the penalties, for example, closely followed the wording of the Masonic penalties. According to the predominant view by historians, Smith used and adapted material from the Masonic rituals in creating the endowment ceremony. All of those first initiated by Smith on May 4, 1842, were longstanding or recent Masons: Adams was the Deputy Grand Master of the Masonic Grand Lodge of Illinois; Whitney, Miller and Kimball had previously been Lodge Masters; Smith's brother, Hyrum, had been a Mason since 1827; and the remaining five participants (Law, Marks, Young, Richards, and Smith himself) had been initiated as Freemasons just weeks before the meeting. However, none of these Masons ever charged Smith with breaking any of Masonry's oaths or revealing its secrets. As a matter of fact, one Mormon historian has noted that these Masonic parallels confirmed to these men "the breath of the restoration impulse and was evidence of Smith's divine calling". The LDS Church has never commented officially on these similarities, although certain features of the two rituals have been called "analogous" by one official Church Historian. The LDS Church apostle John A. Widtsoe downplayed the similarities, arguing that they "do not deal with the basic matters [the endowment] but rather with the mechanism of the ritual." One LDS Church educator, however, was censured in the 1970s by the Church Educational System for arguing that the endowment ceremony had a dependent relationship with the rituals of freemasonry. Some within the LDS Church, particularly Smith's contemporaries, have expressed the view that the endowment was given anciently by God in its original form at the Temple of Solomon, but that the form of the ritual degenerated into the form used by Freemasons. Heber C. Kimball clearly supported this position: "We have the true Masonry. The Masonry of today is received from the apostasy which took place in the days of Solomon and David. They have now and then a thing that is correct, but we have the real thing"
After Smith officiated in Brigham Young's endowment in 1842 Smith told him, "Brother Brigham, this is not arranged perfectly; however we have done the best we could under the circumstances in which we are placed. I wish you to take this matter in hand: organize and systematize all these ceremonies". Young did as Smith directed, and under Young's direction the Nauvoo endowment ceremony was introduced to the church at large in the Nauvoo Temple during the winter of 1845–46. A spacious hall in the temple's attic was arranged into appropriate ordinance "rooms" using canvas partitions. Potted plants were used in areas representing the Garden of Eden, and other areas were furnished appropriately, including a room representing the celestial kingdom. Over 5,500 persons received their endowments in this temple. Young introduced the same ceremony in the Utah Territory in the 1850s, first in the Endowment House and then in the St. George Temple. During this period the ceremony had never been written down, but was passed orally from temple worker to worker. Shortly after the dedication of the St. George Temple, and before his death in 1877, Young became concerned about the possibility of variations in the ceremony within the church's temples and so directed the majority of the text of the endowment to be written down. This document became the standard for the ceremony thereafter. Also in 1877, the first endowments for the dead were performed in the St. George Temple. In 1893, minor alterations in the text were made in an attempt to bring uniformity to the ceremony as administered in the temples. Between 1904 and 1906, the temple ceremony received very public scrutiny during the 1904 Senate investigation of LDS Apostle and U.S. Senator, Reed Smoot. Of particular concern to senators was the ceremony's "law of vengeance", in which, during the hearings, it was revealed that participants took an oath of vengeance to pray that God would "avenge the blood of the prophets on this nation". The "prophets" were Joseph and Hyrum Smith, and "this nation" was the United States. your body ... be cut asunder and all your bowels gush out. [changed to] different ways in which life may be taken. Each temple president received a "President's Book" with the revised ceremony ensuring uniformity throughout the church's temples. The first filmed versions of the endowment were introduced in the 1950s, by a committee headed by Gordon B. Hinckley. That change was initiated by church president David O. McKay as a way of providing the instruction simultaneously in different languages, an innovation made necessary by the construction of the Bern Switzerland Temple, the church's first temple in Europe. As of 2005[update], ceremonies in all but two (Salt Lake Temple and Manti Temple) of the church's 128 operating temples are presented using the filmed version. In 1990, further changes included the elimination of all blood oaths and penalties. These penalties, representing what the member would rather suffer than reveal the sacred signs given them in the ceremony, were symbolized by gestures for having the throat cut, the breast cut open, and the bowels torn out. Changes also included the elimination of the five points of fellowship, the role of the preacher, and all reference to Lucifer's "popes and priests" were dropped. In the temple endowment, women were previously urged to be a priestess "unto her husband," while men were promised they will be priests to God. In January of 2019, that topic was removed from the endowment process, in accordance with other changes that included more lines for Eve in their ritual performance of the Book of Genesis. Also in 2019, a letter from the church's First Presidency stated that "Veiling an endowed woman's face prior to burial is optional." It had previously been required. The letter went on to say that such veiling, "may be done if the sister expressed such a desire while she was living. In cases where the wishes of the deceased sister on this matter are not known, her family should be consulted." A 1996 estimate by Richard Cowan states that around 150 million endowments have been performed, most of which were in behalf of deceased persons. The "initiatory" is a prelude to the endowment proper, similar to Chrismation, and consists of (1) instruction, (2) multiple symbolic washing and anointing ordinances, (3) being clothed in the temple garment, and (4) receiving a "new name" in preparation for the endowment. Washing and anointing are perhaps the earliest practiced temple ordinances for the living since the organization of the LDS Church. There is evidence that these ordinances have been performed since 1832. They were first practiced in the Whitney Store as part of the School of the Prophets and were part of the Kirtland endowment. As part of the endowment ceremony, the ordinance of washing and anointing symbolizes the ritual cleansing of priests that took place at Israel's Tabernacle, Solomon's Temple, and the Second Temple, later known as Herod's Temple. The washing symbolizes being "cleansed from the blood of this generation," and being anointed to become "clean from the blood and sins of this generation." After the washing and anointing, the patron is given the temple garment, formally called the "Garment of the Holy Priesthood". This garment represents the "coats of skins" given to Adam and Eve in the Garden of Eden. Women receive the same ordinances, except for the ordination. As the final part of the initiatory, the patron is given a new name, which is a key word used during the ceremony. In general, this name is only known to the person to whom it is given; however, an endowed LDS woman reveals her name to her endowed husband (but not vice versa). The "new name" is supported in part by Book of Revelation 2:17 and 3:12, referring to a "white stone" with "a new name written" thereon. the sanctity and eternal nature of the family. [During the endowment] you will receive instructions and learn the important events of our eternal journey. You'll learn about the creation of this world and about our first parents being placed in the Garden of Eden. You'll learn how Satan tempted Adam and Eve and how they were cast out of the garden and out of the presence of God into our world, with its opposition in all things. Here they learned about the joys as well as the discomforts of life. After Adam and Eve were cast out of the Garden of Eden and placed in the world where we now live, they were taught the gospel, and they entered into covenants of obedience with God, just as you will in the temple. How we keep these covenants determines the nature of the life we will enjoy after this mortal experience. In the eternal world there are kingdoms of glory. You will inherit one of these, depending on your performance in this life. The aim of the gospel and the purpose of temple marriage are not only to keep us together, but also to make us eligible for Heavenly Father's highest reward for us — exaltation in the celestial kingdom. This kingdom is symbolized by the celestial room. The endowment is often thought of as a series of lectures where Latter-day Saints are taught about the creation of the world, the events in the Garden of Eden, what happened after Adam and Eve were cast out of the Garden into the "telestial world", and the progression of righteous individuals through "terrestrial" laws to the celestial kingdom and exaltation. During the ceremony, Latter-day Saints are dressed in temple clothes or temple robes, are taught in ordinance rooms about various gospel laws (including obedience, chastity, sacrifice and consecration) and make covenants to obey these laws. The early Mormon leader Brigham Young taught that participants are given "signs and tokens" that "enable you to walk back to the presence of the Father, passing the angels who stand as sentinels" and gain eternal exaltation. At the end of the ceremony, the participant is "tested" on their knowledge of what he or she was taught and covenanted to do and then admitted into the celestial room, where he or she may meditate and pray. Sometimes denot[ing] an agreement between persons (1 Sam. 23:18) or nations (1 Sam. 11:1); more often between God and man; but in this latter case it is important to notice that the two parties to the agreement do not stand in the relation of independent and equal contractors. God in his good pleasure fixes the terms, which man accepts. The same word is sometimes rendered "testament." The gospel is so arranged that principles and ordinances are received by covenant placing the recipient under strong obligation and responsibility to honor the commitment. Thus the severe consequences to Ananias and Sapphira, who deliberately broke their covenant and lied unto God (Acts 5:1–11). The temple ceremony involves entering into solemn covenants. Critics[who?] have expressed concern that a person may be denied access to the specific details of these covenants until that person is faced with making them in the temple, making it impossible to reflect on their meaning or ramifications. The LDS Church does offer a temple preparation seminar and freely publishes both the student booklet, Preparing to Enter the Holy Temple, and the teacher's manual, Endowed from on High: Temple Preparation Seminar, on its website. These books and the seminar which may be held are designed to help prepare members for the temple; attendance at the seminar is often required before a bishop will issue a temple recommend for the first time to a member. In the seminar, it is taught that all of the covenants entered into during the endowment have a basis in Latter-day Saint scripture; however, the specifics of the covenants are not revealed. At the end of the endowment ceremony the participant is tested at a physical veil by a man representing the Lord on the signs and tokens just learned. Before 1990 at the veil the participant also put their arm around and pressed their cheek, shoulders, knees and feet against the person through the veil in what was called "the five points of fellowship." The endowment is open only to Mormons who have a valid "temple recommend." To be eligible to receive a temple recommend, one must be deemed worthy by church leadership and have been a member of the LDS Church for at least one year. A male member of the church must hold the Melchizedek priesthood to participate in the endowment. A temple recommend is signed by the person receiving the recommend, a member of the person's bishopric and a member of the stake presidency, who each perform a personal, one-on-one "worthiness interview." Persons seeking a recommend to attend the temple for the first time and receive their endowment will generally meet with their bishop and stake president. These interviews cover what the church believes to be the most important factors of personal morality and worthiness, including whether the person has a basic belief in key church doctrines such as the divinity of Jesus and the restoration; whether the person attends church meetings and supports the leadership of the LDS Church; whether the person affiliates with Mormon fundamentalists or other people considered by the church to be apostate; whether the person is honest and lives the law of chastity and the Word of Wisdom; whether the person abuses family members; whether the person pays tithing and any applicable spousal or child support; and whether the person has confessed to serious past sins. Prior to participating in the endowment, members of the LDS Church frequently participate in a six-part temple preparation class which discusses temple-related topics but does not directly discuss the details of the ceremony. Official church publications state that temple ceremonies are confidential and not to be discussed outside the temple. B. H. Roberts declared that certain aspects of the endowment ceremony were intended to be "secret from the world". In this regard, Facsimile No. 2 in the Book of Abraham (part of the LDS Church standard works) clarifies that there are things that "cannot be revealed unto the world; but is to be had in the Holy Temple of God." This information includes, in the initiation and instructional/testing phases of the endowment ceremony, certain names and symbolic gestures called tokens and signs. Prior to revisions in 1990, the LDS Church's version of the endowment also included a gesture called a "penalty." The ceremony stated that the "representation of the execution of the penalties indicates different ways in which life may be taken". However, the LDS Church has removed the "penalty" portions of the ceremony, protecting the "names", "tokens," and "signs" by a simple "covenant and promise." Still, such information has been published in various sources, unauthorized by the LDS Church. Other than the ceremony's signs and tokens (and formerly penalties), which remain a central part of the ceremonies, the remainder of the ceremony carries with it no covenants of secrecy. However, most Latter-day Saints are generally unwilling to discuss the specific details of the ceremony. Latter-day Saints commonly state that the rituals are "sacred" but not "secret," and Latter-day Saint apostle Boyd K. Packer has encouraged members not to "discuss the temple ordinances outside the temples" as well as top leaders in 2019. In addition, church members are instructed by top church leaders that the only place where the temple ceremonies should be discussed, even amongst faithful members, is within the temple. Some Mormons have suggested that the Latter-day Saint reluctance to discuss the endowment encourages attacks and unauthorized exposés by evangelical Christians and others, and therefore advocate a more transparent attitude toward the ceremony. ^ John D. Charles. (2004). Endowed from on high: Understanding the symbols of the endowment. Springfield, UT: Horizon Publishers. ^ a b Preparing to Enter the Holy Temple, (Salt Lake City, Utah: LDS Church). ^ Michael W. Homer. (1994). “Similarity of priesthood in masonry”: The relationship between Freemasonry and Mormonism. Dialogue, 27(3), 2-113. ^ a b Davies, Douglas James (2000). The Mormon Culture of Salvation: Force, Grace, and Glory. Burlington, VT: Ashgate. pp. 78–79. ^ Nibley, Hugh. "Meanings and Functions of Temples." In Encyclopedia of Mormonism, edited by Daniel H. Ludlow (New York: Macmillan, 1992) p.1460. ^ a b Ro, Brandon (June 2013). "(Re)Interpreting the Cosmic History of the Mormon Temple Experience: Theological Connections between Jewish and Catholic Sacred Space". Journal of Comparative Theology. 4 (1): 21–73. ^ David John Buerger, The Mysteries of Godliness: A History of Mormon Temple Worship, 2nd ed. (San Francisco: Smith Research Associates, 2002), 166. ^ Von Wellnitz, Marcus. "The Catholic Liturgy and the Mormon Temple." BYU Studies 21 (1981): 3-35. ^ Gaskill, Alonzo (2011). Sacred Symbols: Finding Meaning in Rites, Rituals, and Ordinances. Springville, UT: CFI. ^ Gospel of Luke 24:49 (Authorized King James Version) ("And, behold, I send the promise of my Father upon you; but tarry ye in the city of Jerusalem until ye be endowed with power from on high."). ^ Phelps 1833, p. 84. D&C 38:32. Phelps 1833, pp. 97–98. D&C 43:16. ^ Phelps 1833, pp. 97–98. D&C 44:1-2 (God would call the elders of the church together in Kirtland in a General Conference and "pour out [his] Spirit upon them in that day they assemble themselves together"). Kirtland Revelation Book, p. 91 (revelation given to an individual assuring him that "at the conference meeting he [would] be ordained unto power from on high"). Cannon and Cook, 6-7 (elders at the conference were ordained for the first time to the High Priesthood); The official church history states that during this conference, "the authority of the Melchizedek priesthood was manifested and conferred for the first time upon several of the Elders" (Roberts 1902, pp. 175–76). The editor of this history believed this was a mistake, because it would not be consistent with the then-common Mormon belief that the priesthood had been conferred prior to the church's founding in 1830. (Id. at 176.) Several modern historians believe the official record was not mistaken and is consistent with other historical records, and that this 1831 endowment marked the restoration of the Melchizedek priesthood (Quinn). Corrill, 18 (ordination "consisted [of] the endowment--it being a new order--and bestowed authority"). Booth 1831 (many of the Saints "have been ordained to the High Priesthood, or the order of Melchizedek; and profess to be endowed with the same power as the ancient apostles were"). ^ D&C 88:119. D&C 94:3 (identifying the location of the temple in Kirtland). D&C 95:8 (in this building the Lord "design[ed] to endow those [he] had chosen with power on high"). Kirtland Revelation Book, p. 98 (referring to the Kirtland endowment as a "greater endowment"). ^ See: Arrington, "Oliver Cowdery's Kirtland, Ohio, 'Sketch Book,'" BYU Studies, Summer 12 : 416-420; Cook and Backman, Kirtland Elders' Quorum Record, 1836-1841 pp. 1-9. ^ "President Gordon B. Hinckley," Ensign (supp. ), March 2008, pp. 2–13. ^ Buerger 1987, p. 55. ^ Homer 1994, p. 1. ^ Manuscript History of Brigham Young, November 13, 1858, p. 1085, LDS Church archives. ^ a b Bancroft (1859, p. 358). ^ Bennett (1842, p. 248). ^ Green (1859, p. 49). ^ "Next came the part of the ceremony devoted to the higher Melchizedek Priesthood with its special garments (white robe; white, turban-like cap with a bow over the right ear; apron; and white moccasins) and more complicated signs and tokens like the Sign of the Nail; the Patriarchal Grip, or the Sure Sign of the Nail; and the sign of the Second Token." The Mormon Murders, Steven Naifeh, Gregory White Smith, St. Martins's Press, New York, 1988, ISBN 0-312-93410-6, p. 69. ^ In 1990, several significant portions of the endowment ceremony performed worldwide in Mormon temples were eliminated: the wording: "even at the peril of your life" and "The representation of the penalties indicates ways in which life may be taken," was deleted. Women no longer have to swear an oath and covenant of obedience to their husbands; a segment showing a Christian minister working hand-in-hand with Lucifer to deceive mankind for profit by teaching orthodox Christian doctrine was removed; three morbid gestures that imply Mormon patrons will lose their lives through having their throats slashed, their hearts torn out, and their abdomens cut open if they reveal temple secrets; and the Five Points of Fellowship in which initiates embrace The Lord (a male temple worker) through openings in the Veil of the temple." A Mormon Odyssey, Tamra Jean Braithwaite, Xlibris Co., 2003, ISBN 1-4134-1878-3, p. 212. ^ Hammond, Elizabeth (2015). "The Mormon Priestess: A Theology of Womenhood in the LDS Temple (2014)". In Brooks, Joanna; Steenblik, Rachel Hunt; Wheelwright, Hannah (eds.). Mormon Feminism: Essential Writings. Oxford University Press. ISBN 978-0190248031. ^ Riess, Jana (3 January 2019). "Major changes to Mormon temple ceremony, especially for women". religionnews.com. Religious News Service. Retrieved 5 January 2019. ^ a b c Fletcher Stack, Peggy; Noyce, David (2 January 2019). "LDS Church changes temple ceremony; faithful feminists will see revisions and additions as a 'leap forward'". sltrib.com. Salt Lake Tribune. ^ Preparing to Enter the Holy Temple. LDS Church. August 2002. p. 7. The endowment and the temple work as revealed by the Lord to the Prophet Joseph Smith ... fall clearly into four distinct parts: The preparatory ordinances; the giving of instruction by lectures and representations; covenants; and, finally, tests of knowledge. ^ Widstoe, John A. (April 1921). "Temple Worship". The Utah Genealogical and Historical Magazine. 12 (2): 58. ^ a b c d e f Buerger 1994. ^ 'Mormon Underwear' is the Temple Garment and is Sacred to Latter-day Saints. Youtube.com. Mormon Newsroom. LDS Church. 22 October 2014. Event occurs at 2:50. ^ "Temple Garments". Mormon Newsroom. ^ "In The House of the Lord", New Era, 4(5), June 1975, p. 20. ^ Steinfels, Peter (3 May 1990). "Mormons Drop Rites Opposed by Women". The New York Times. Participants follow a dramatic reenactment, once performed by actors but now presented in most temples by films, of the Creation, life on earth and a return to God. ^ Hammarberg, Melvyn (1 July 2013). The Mormon Quest for Glory: The Religious World of the Latter-day Saints. Oxford, UK: Oxford University Press. p. 172. ISBN 0199737622. ^ Brooks, Joanna (2 November 2015). Mormon Feminism: Essential Writings. Oxford, UK: Oxford University Press. p. 286. ISBN 0190248033. For men, 'the Lord' is Elohim who gives and later tests the man's names, signs, and tokens. ^ Dart, John (5 May 1990). "Mormons Modify Temple Rites : Ceremony: Woman's vow to obey husband is dropped. Changes are called most significant since 1978". Los Angeles Times. Also dropped is an 'embrace' of a man representing God, who stands behind a ceiling-to-floor veil. Reaching through a slit in the veil, the church member puts his or her hand to the back of the deity and presses against him at the cheek, shoulders, knees and feet with the veil between them. The contact at 'five points of fellowship,' including the hand to his back, has been omitted, although the member must still give a secret handshake and repeat a lengthy password. ^ Preparing to Enter the Holy Temple. LDS Church. August 2002. p. 3. You must possess a current recommend to be admitted to the temple. This recommend must be signed by the bishop of your ward and the president of your stake. ... Only those who are worthy should go to the temple. The bishop has the responsibility of making inquiries into our personal worthiness. ^ Preparing to Enter the Holy Temple. LDS Church. August 2002. p. 2. We do not discuss the temple ordinances outside the temples. ... They are kept confidential lest they be given to those who are unprepared. ... And, the Lord has every right and authority to direct that matters relating to the temple be kept sacred and confidential. ^ Testimony of B.H. Roberts before a U.S. Senate Committee, as reported in Burrows & Foraker 1904, p. 741. ^ Buerger 1987, p. 34. ^ a b "First Presidency Statement on Temples". mormonnewsroom.org. LDS Church. 2 January 2019. A dedicated temple is the most holy of any place of worship on the earth. Its ordinances are sacred and are not discussed outside a holy temple. ^ ElRay L. Christiansen, "Some Things You Need to Know about the Temple" New Era, June 1971: "The ordinances of the temple are so sacred that they are not open to the view of the public. They are available only to those who qualify through righteous living. They are performed in places dedicated especially for this purpose. Their sacred nature is such that discussion in detail outside the temple is inappropriate." Anderson, Devery S.; Bergera, James, eds. (2005). Joseph Smith's Quorum of the Anointed, 1842-1845: A Documentary History. Salt Lake City: Signature Books. ISBN 1-56085-186-4. OCLC 57965858. .
Bancroft, Hubert Howe (1889), The Works of Hubert Howe Bancroft, Vol. XXVI: History of Utah 1540-1886, San Francisco: The History Company . Beadle, John Hanson (1870), Life in Utah, Philadelphia: National Publishing, LCCN 30005377, OCLC 544755 . Bennett, John Cook (1842), The History of the Saints : Or, an Exposé of Joe Smith and Mormonism (3rd ed. ), Leland & Whiting, p. 248 . Booth, Ezra (October 20, 1831a), "Mormonism—No. II (Letter to the editor)", The Ohio Star, 2 (42): 1 . Brown, Lisle G. (1979), "The Sacred Departments for Temple Work in Nauvoo: The Assembly Room and Council Chamber", BYU Studies, 19 (3): 361–374, archived from the original on 2014-03-13 . Brown, Lisle G. (2006), Nauvoo Sealings, Adoptions, and Anointings, A Comprehensive Register of Persons Receiving LDS Temple Ordinances, 1841-1845, Salt Lake City: Signature Books, ISBN 1-56085-198-8, LCCN 2005049999, OCLC 60835589 . Buerger, David John (1987), "The Development of the Mormon Temple Endowment Ceremony", Dialogue: A Journal of Mormon Thought, 20 (4): 33–76 . Canon, Donald Q.; Cook, Lyndon (1983), Far West Record, Salt Lake City: Deseret Book, ISBN 0-87747-901-1 . Corrill, John (1839), Brief History of the Church of Christ of Latter Day Saints (commonly called Mormons) including an Account of their Doctrines and Discipline, with Reasons of the Author for leaving the Church, St. Louis, Missouri: John Corrill, LCCN 87209092, OCLC 18071277 . Ehat, Andrew (1982). "Joseph Smith's Introduction of Temple Ordinances and the 1844 Mormon Succession Crisis", Thesis, Brigham Young University, Provo, Utah. Homer, Michael W. (1994), "Similarity of Priesthood in Masonry: The Relationship between Freemasonry and Mormonism. ", Dialogue: A Journal of Mormon Thought, 27 (3): 1–113, archived from the original on 2011-06-13 . McMillan, Henry G., ed. (1903), The Inside of Mormonism: A Judicial Examination of the Endowment Oaths Administered in All the Mormon Temples, by the United States District Court for the Third Judicial District of Utah, to Determine Whether Membership in the Mormon Church Is Consistent with Citizenship in the United States, Salt Lake City: The Utah Americans, LCCN unk84033965, OCLC 60734167 . Morgan, William (1826), Illustrations of Masonry by One of the Fraternity Who has devoted Thirty Years to the Subject: "God said, Let there be Light, and there was light", Batavia, N.Y.: David C. Miller, LCCN 01005502, OCLC 22186577 . Packer, Boyd K. (1980). The Holy Temple. Bookcraft Publishers, Salt Lake City, Utah. ISBN 0-88494-411-5. LDS Church (2002). Preparing to Enter the Holy Temple. LDS Church, Salt Lake City, Utah. † Note: This pamphlet is adapted from Packer's The Holy Temple. Green, Nelson Winch (1859), Fifteen Years Among the Mormons, New York: H. Dayton Publisher . Roberts, B. H., ed. (1902), History of the Church of Jesus Christ of Latter-day Saints, 1, Salt Lake City: Deseret News . Smith, Joseph (April 1838), History of the Church , copied to Smith, Joseph; Mulholland, James; Thompson, Robert B.; Phelps, William W.; Richards, Willard (1839–1843), "History of the Church, Ms. A–1", in Jessee, Dean C (ed. ), Personal Writings of Joseph Smith, Salt Lake City: Deseret Book (published 2002), ISBN 1-57345-787-6 . Talmage, James E. (1912), The House of the Lord: A Study of Holy Sanctuaries, Ancient and Modern, Salt Lake City: Deseret News, LCCN 12023144, OCLC 6391058 . Tanner, Jerald and Sandra (1990), Evolution of the Mormon Temple Ceremony: 1842-1990, Salt Lake City: Utah Lighthouse Ministry, OCLC 22686324 . United States Senate (1904), Burrows, Julius Caesar; Foraker, Joseph Benson (eds. ), Proceedings Before the Committee on Privileges and Elections of the United States Senate in the Matter of the Protests Against the Right of Hon. Reed Smoot, a Senator from the State of Utah, to Hold His Seat, 1, Washington: Government Printing Office . Widstoe, John (1954). Discourses of Brigham Young, Deseret Book, Salt Lake City, Utah. Widstoe, John (1960). Evidences and Reconciliations, Bookcraft, Salt Lake City, Utah. † The materials published by the LDS Church directly may only be available from the church's distribution center. Wikimedia Commons has media related to Endowment (Mormonism). Brown, Matthew B. (1998). "Of Your Own Selves Shall Men Arise: Review of The Mysteries of Godliness: A History of Mormon Temple Worship by David John Buerger". FARMS Review of Books. 10 (1): 97–131. An article by FARMS that critiques in detail the accuracy and reliability of David John Buerger's The Mysteries of Godliness: A History of Mormon Temple Worship. The LDS Endowment, at ldsendowment.org – a detailed source of information about the endowment. Spackman, Ben, "Category: Temple", MormonMonastery.org, retrieved 2014-03-12 . Comprehensive list of articles and books on LDS temples; site also includes an LDS Temple Preparation FAQ.